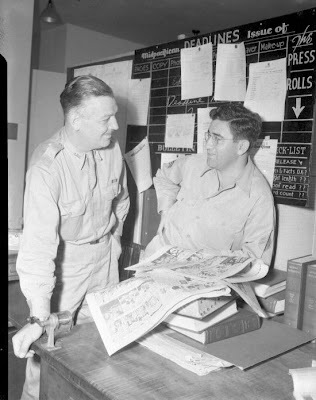 Recently I posted a previously unpublished photo of Superman co-creator Jerry Siegel; it shows him in uniform during World War II, at work with a partner on a comic strip called Super GI. Tony, the man who owns that photo, is the son of a Stars and Stripes photographer. He wrote, “My father's only remark about Siegel was that he was not very generous with his son.” This is something we, sadly, already know to be true on some level. That man has since sent me three other never-published, WWII-era Siegel images, and apparently has at least one or two more. One was labeled “officer and cartoonist,” though Jerry was actually the former and not the latter (he was a writer). 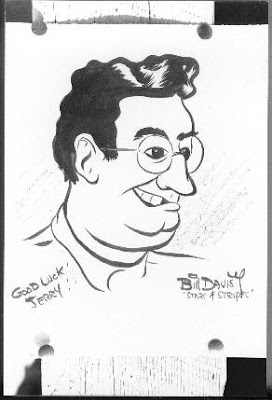 Another is a sketch of Jerry by a Bill Davis. I don’t know if he is an artist I should already know about. 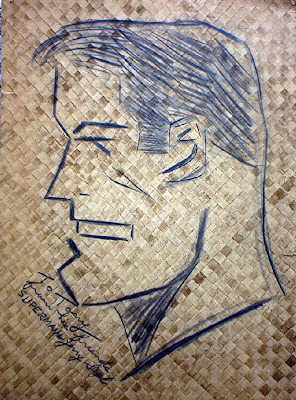 A third is a sketch of Superman by, possibly, Jerry himself (which would make the label of the first more accurate). It’s inscribed to Tony, who was five years old at the time. Who did the drawing? I don't know. It could have been Siegel; it looks like a rather simple set piece, a visual autograph. The paper is a design based on Hawai'an reed mat— it works almost as graph paper, making the drawing easy to do. How did Joe and Jerry collaborate in WWII when they were at least 2,000 miles apart—by mail? It [now] occurs to me that Joe [could’ve done] a couple of dozen drawings that Jerry just signed when his co-[officers] hit him up for a drawing? Permission to reprint these images is not mine to give. If you're interested, please ask me and I'll be happy to forward your request to the owner. You can never find these things when you need them, but I know out there on the web is a verified Siegel Superman head sketch, that was done as a novelty at a convention in the 70s or 80's. I have a keen eye for art, and I recall that sketch looking almost exactly like the one here from the photographer's son. I can state *positively* that it isn't Shuster, and with 90% certainty that it *is* by Siegel.